S&P 500 only increased 7 basis points on Monday. But the Russell 2000 was up 0.84%. Russell 2000 is up 12.03% year to date, while the S&P 500 is only up 8.1%. Either the Russell 2000 is outperforming because it has a higher beta than the S&P 500. Also the market has been in risk on mode or because the American economy is outperforming Europe’s economy. We also must consider that during December, investors thought junk bonds were at the beginning of a major sell off. So they sold small caps. Once the Fed turned dovish, small caps had more of a reason to rally than large caps. Nasdaq increased 0.13% and the CNN fear and greed index increased 1 point to 62. Best sectors were energy and industrials which increased 0.46% and 0.55%. Even with the decline in global manufacturing growth, industrials continue to do well. Boeing stock is up 24.75% year to date. Worst sectors were healthcare and communication services as they fell 0.13% and 0.63%. I think it’s great for the stock market to remain stable because the only options are a correction or stability. There is no way the stock market can keep rallying at this year’s rate given the declining earnings estimates. Stocks can increase when earnings estimates fall. Stocks can even increase when earnings fall. However, at a certain point stocks get too expensive. Expecting +15% gains in 2019 while earnings fall is a mistake. Vanguard stated its 10 year median annualized estimate for U.S. stocks is a 5% increase. That’s down from about 8% five years ago. The long term average is 7%. It’s very reasonable to expect less than average returns because this cycle is about to be the longest since the 1800s. There will probably be 1 recession and there might be 2 recessions in the next 10 years. The Vanguard estimate is much more optimistic than what the Shiller PE projects. It’s fair to point out that including Shiller PE data from the late 1880s probably is a mistake. Consumers - The sectors that dominate the stock market now are wildly different from the late 1880s. If you assume stocks are going to gain 5% per year, it means your threshold for trading gains to beat the market has gotten lower. However, if you trade stocks in a way that your returns are uncorrelated with the market, it will be easier to beat it. Now, if you are just going long momentum names, you might run into trouble. It’s also worth considering the concept that the doom and gloom crowd that projects no long term gains could be wrong. With inflation, returns would be negative in that scenario. Make sure to avoid the charts that imply there’s almost a guarantee stocks won’t increase in the long term. The next 10 years are very tough to predict with extreme accuracy. The consumer sentiment indexes have been showing a decline in optimism in January. Consumers think their personal economic situation is great now and will improve in the next year. However, they are nervous about the volatility in the stock market, the government shutdown, and the trade war. 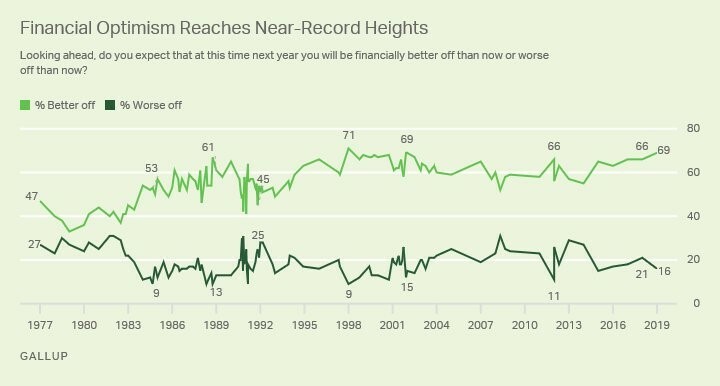 The chart below shows in the Gallup survey, 69% of Americans expect to be better off financially in the next year and only 16% expect to be worse off. This chart is great because it includes data since 1977. As you can see, only in 1998 were consumer more optimistic as 71% expected to be better off financially. Those expecting to be worse off is at 16% which isn’t as close to the record low which was 9% which was reached in the 1984 and 1998. The political climate makes it seem like the economy is in dire straits, but that’s far from reality. This chart isn’t like the University of Michigan one which peaks at the end of expansions and troughs at the worst point of recessions. Consumers - Recession Or Not? 3 months ago, investors were asking the question whether the decline in stocks was a correction or a bear market. The S&P 500 just barely pushed into bear market territory by falling 20%. Now the question is whether this was a bear market with no recession or a bear market with a recession. This question is much easier to answer because technically, a 19% decline is a correction and a 20% decline is a bear market. It’s easy to see some European economies are about to fall into a recession. American Q1 GDP growth will be hurt by the government shutdown. However, the intermediate term trend suggests there will be solid growth in 2019. The CNBC median estimate for Q4 2018 GDP growth is 2.7%. Some of the reports that were delayed by the government shutdown still haven’t come out yet. 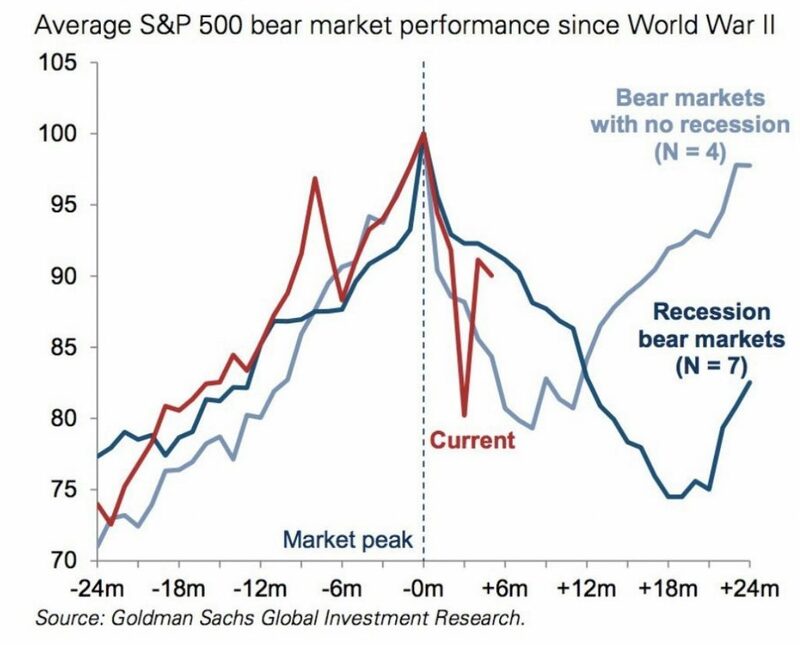 The chart below shows the S&P 500’s performance in bear markets with and without recessions. On average, bear markets without recessions recover all their losses after 2 years. This is about to be the 5th bear market without a recession since World War II which means it’s far from certain that stocks will rebound in this manner. So far, stocks are ahead of schedule. It seems like there will be at least a modest pullback in the next few weeks. At worst, there will be a 2nd leg down. I’m not optimistic that stocks will have an unending rally because we are entering a shallow earnings recession. The U.S. economy won’t enter into a recession in 2019. Inflation is low, the Fed is pausing rate hikes, the consumer isn’t leveraged, the banks are well capitalized, and wage growth is strong. There isn’t a housing bubble and stock market valuations aren’t extreme. At the trough of the 20% decline, stocks became very cheap even if earnings don’t grow in 2019 or fall slightly. Personally, I think it would take a lot more than a modest European recession and sub-6% GDP growth in China to put America into a recession.